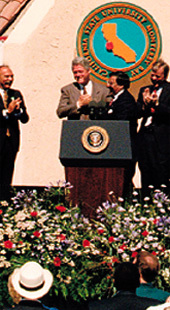 "With the spotlight of the nation upon us as a ‘National Model of Base Closure Reuse,’ CSUMB is fortunate to have engaged Sasaki Associates as our master planning consultant. The planning process Sasaki shaped, and the master planning documents they produced, are sensitive to our heritage, and appropriate to guide and support our growth and development." 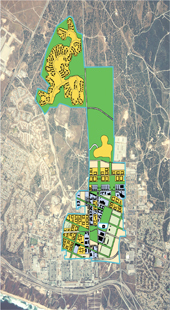 The master plan promotes physical and programmatic ties to the surrounding community for this open campus that occupies a portion of the former Fort Ord military base. The visionary plan addresses campus capacity, flexibility, environmental sustainability, and economic vitality. The plan provides community centers, retail areas, and bike and pedestrian paths for the existing suburban East Campus; maintains the open land of the Central Campus; and concentrates development in the West Campus to heal areas most affected by military development. 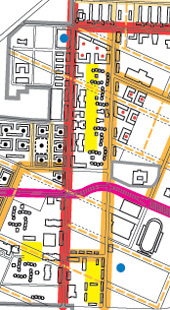 A series of streets and “spines” in the West Campus creastes connections with the surrounding cities of Seaside and Marina while maintaining the street grid of the military installation. CSUMB’s open campus encourages sustainable ecological development by using the “spines” to minimize run-off, using xeriscape and indigenous plantings that reflect the region’s character, reusing existing buildings and infrastructure, and siting new development to optimize solar orientation and minimize wind impact. The plan incorporates public and private sector activities, such as retail space, community and educational employment centers, to promote economic vitality and to ensure critical densities of activity at each stage of campus growth.